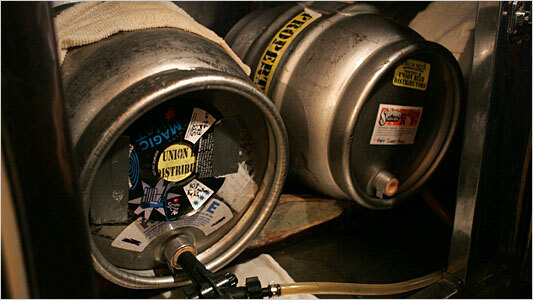 All weekend long, The Gate (321 5th Avenue in Park Slope) will be hosting a it's second annual cask beer festival. More than 15 casks of unfiltered, unpasteurized beer will be available for purchase. More and more bars throughout the city are starting to carry cask beers and this is a great opportunity to see what the fuss is all about. Many beer connoisseurs will point to the fact that cask conditioning enables malt and hop flavors to develop, resulting in a richer tasting drink with more character than standard keg. We tend to agree! Nice! Might have to stop by after work to kick off the weekend right.